are ready to take the next step in the world of business and human resources. a highly customizable program that will give them the expertise they need to catapult their careers. more effective business leaders who know how to identify, attract and foster the best talent. If you’re a working professional who wants to take your career in business and human resources to the next level, this Dual Degree is for you. It provides the technical, organizational and managerial skills you need to implement a new kind of HR—and guarantee professional success. 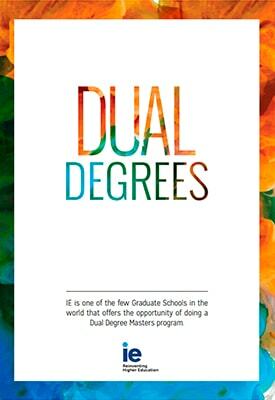 By pursuing two degrees in tandem, you’ll elevate your expertise and diversify your knowledge, all while enjoying the top-tier, highly personalized education that IE is famous for. This program combines IE Business School’s International MBA with the Master in Talent Development and Human Resources from IE School of Human Sciences and Technology, creating the kind of complementary skill set that will make you stand out from the crowd. Not only will you become an expert in the fundamental aspects of business and management; you’ll complement this expertise with an in-depth understanding of how to identify, attract and retain the best talent. By earning two world-class master’s degrees in less than two years, you’ll fast-track your career while simultaneously demonstrating your flexibility. At IE, we’re all about the big picture; we know that the greatest leaders are as versatile as they are determined. If you’re ready to become a conscientious, capable and innovative HR professional—while also developing your leadership skills—you’ve found the perfect program. I think the fact that there are only 20 of us with 17 different nationalities—the fact that we get to learn from so many different cultures—is great! I’m learning as much outside the classroom as inside.